Everyone from young to old has certainly been inspired for a fresh cut by one of the Cristiano Ronaldo haircut styles. Along with his breathtaking performance on the field, the army of the fans enthusiastically tracks all his hairstyle changes. Even if you are not among them, you should take a closer look at Ronaldo’s hairdos anyway, as they really worth your attention. 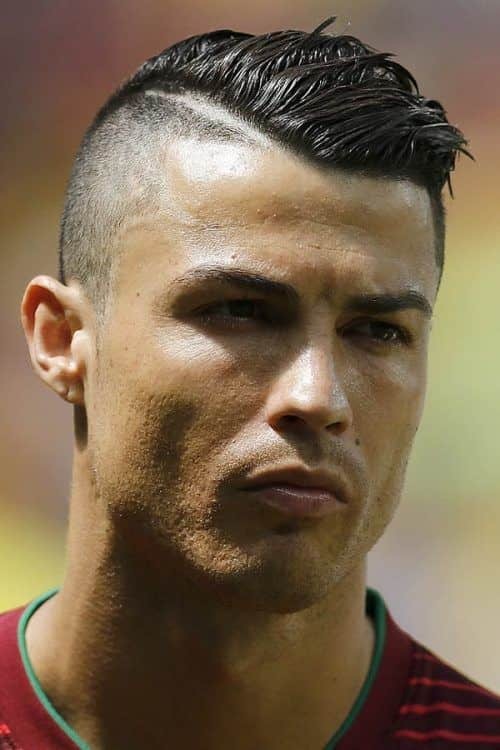 No matter if you’re a soccer fan or not, you’ve almost certainly heard of Cristiano Ronaldo haircut. This football player has been popular with the crowds not only for his skillful performance on the field but also for his outstanding hairstyle. And even though his gameplay will be most likely appreciated only by true football connoisseurs, the way CR7 styles his hair is definitely worth everyone’s attention. For this very reason, we’ve picked out the most prominent Ronaldo’s haircuts to inspire your next look. Even though the pompadour haircut was initially worn be women, many men have proved it to be a true virile style. 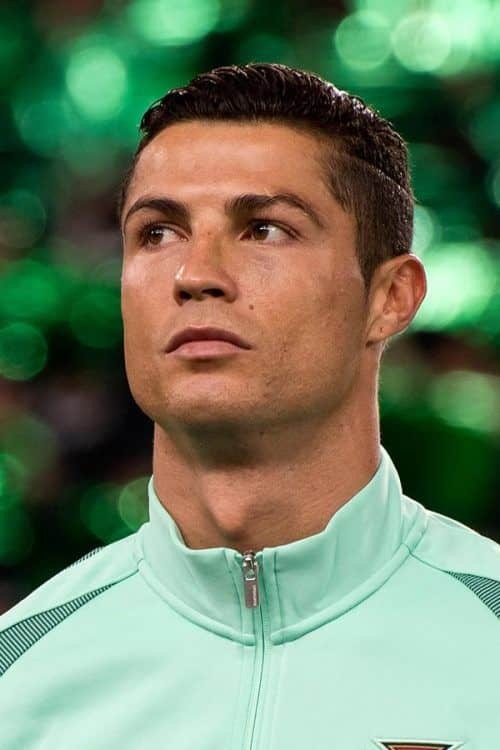 Cristiano Ronaldo haircut features a short pomp combed over to one side and separated from the sides with a hard part haircut. Product-wise, Cristiano opts for a hair gel, and he doesn’t skimp on it for sure. This ‘do is no exception. 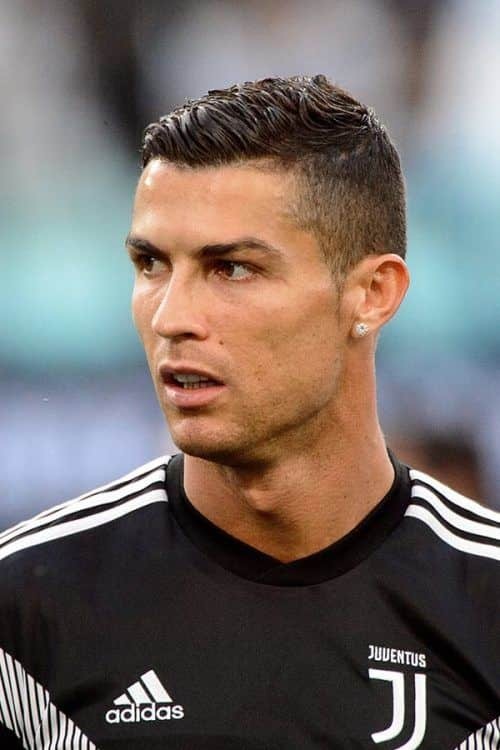 Spiky hair can make you look a lot younger, which CR7 successfully exposes. 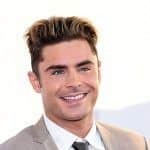 This hairstyle is also a great option for guys with round face shape, as thanks to the high top, it visually elongates the face. To keep all the attention on the spiky top, buzz the sides and back very shortly. With an Ivy League haircut, it’s hard to tell whether you’re looking at the sports celebrity or a Harvard student. Such short hair cuts combine trimmed sides with a longer top combed over to either side. A side part is as important for this cut as a football for the game. From time to time, Ronny plays around not only with medium haircuts for men and their styling but also with coloring. 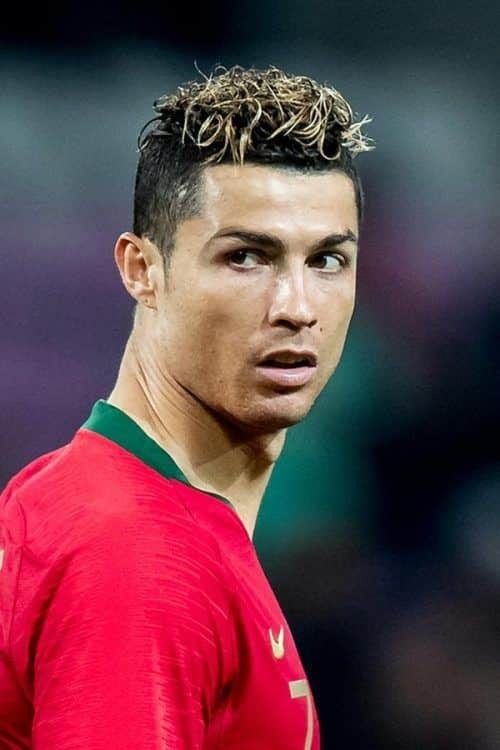 Cristiano likes to add golden highlights to the top section of his hair for added volume and depth, which looks incredibly complimentary on wavy hair men. Not all Ronaldo’s men haircuts are medium in length with an extensive top. Sometimes, he chops all his locks off, sporting a classic military buzz cut. However, as he always adjusts the hairstyles to his individual style, the top is cut a couple of inches longer than the rest of the hair and a shaved in line is added to one side, which creates additional contrast. 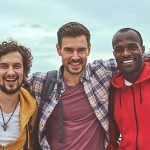 Modern haircuts for men teach us to make the most out of our natural features. 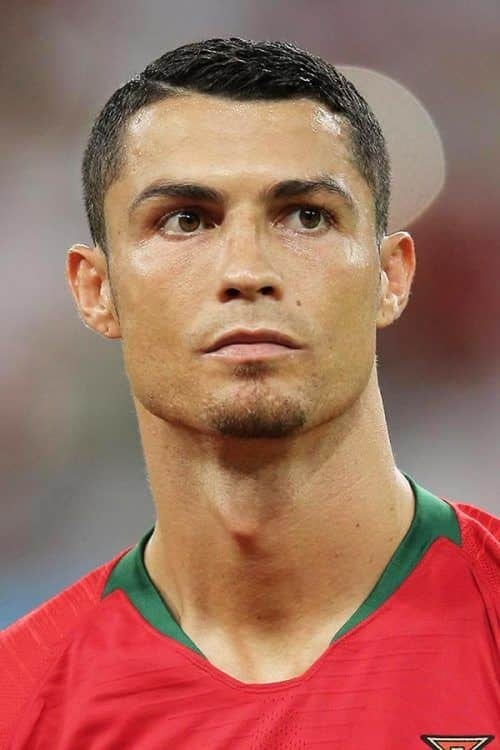 If you have curly and thick thatch like Cristiano’s, you may simply style it high and tight by raking your fingers through the top using a bead of a hair product. It’s easy, stylish and elegant at the same time. Football stars, like any other celebrities, also often attend formal events. The slick back hairstyle gives a neat and clean appearance that perfectly suits the formal ambiance. 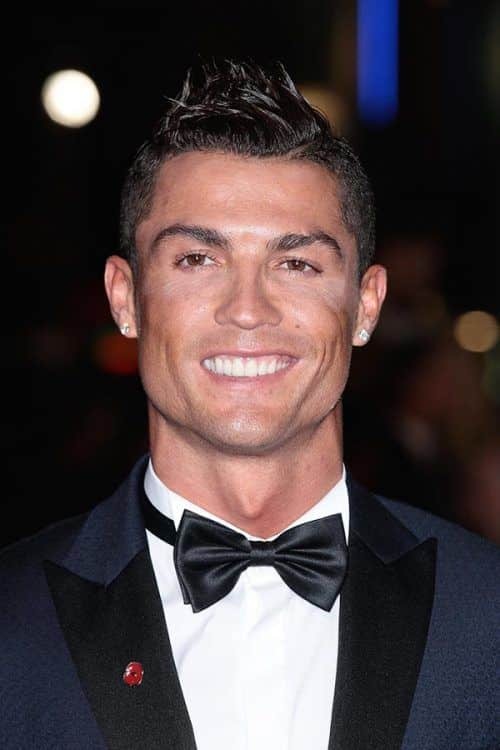 To embellish the look with his personal signature, Cristiano adds golden highlights to the top. Sleek and brushed back haircut styles for men are unimaginable without a generous amount of a styling product. In our case, gel, of course. When his short haircut starts to grow out, CH7 immediately go for styling it. The short spiky top looks boyish and super cool paired with trimmed sides and back. This hairstyle is great for any occasion, from a Red Carpet event to a workout in the gym. Don’t forget about the portion of the product for extra texture and hold. Ronaldo often plays around with a Mohawk. However, he never goes after a traditional one, sporting its different variations instead. Here, he has a high top molded up into a point and set with a dime-sized amount of a styling product. The sides are given a high tapered men’s haircut, which helps to draw attention to the hawk. This is a bolder version of a faux hawk haircut. It features an undercut and a hard part on each side of the head. The top is pushed back and secured with a hair gel for a textured and refined look. Going classic is never a miss. Polished and neat comb over allows you to sport it during the most intense football matches without worrying about your look. What helps men’s short haircuts to sit flawlessly is a sheer amount of a stronghold gel. Arguably, nobody knows more ways of styling spiky hair than Cristiano does. This time he goes for long unkempt spikes on top. To achieve messy hairstyles men with naturally curly and spiky locks like Ronaldo’s should simply gel them and let dry tousled. 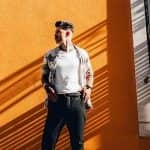 To make the top a focal point of the look, you can pair it with a disconnected undercut. Draw inspiration for a new haircut from a celebrity’s look is always a smart move. Especially, when it concerns such a known for his outstanding hairstyles football star Cristiano Ronaldo. We handpicked his most attractive and popular ‘dos, which won’t take you long to recreate.